Hi-Lites Motor Club will be heading to Knoebels on Oct 5th for their annual Fall Foliage Cruise. It is great timing because Knoebels is having their Covered Bridge Festival and Car Show the same day. This should prove to be a wonderful trip and many members have expressed a lot of interest. Keep in mind, our Travel Cruises are open to the public and you do not have to be a Hi-Lites member to participate. We will be meeting at Jacs Ice Cream and Eatery in Lehman (the former Curves building - by Gunn Brothers Garage) between 7:30 and 8:00am and leaving promptly at 8:00am. We can use Gunn Brother Garage for overflow parking if needed. The route will be 118 to 487 to Knoebels. The lights in Bloomsburg a Catawissa will prove challenging to keep everyone together but we will do our best. Several of us will be using CBs to keep in touch, as the Walkie Talkies used in the past have proven not very affective when trying to communicate between the first and last cars in the parade. We will tune in to Channel 13 and use 07 as a backup. We may want to pull into Rohrbach's Farm Market (at the top of hill before Knoebles) or Southern Columbia High School ( a liitle farther up the road) to tighten up the group so we get to the park as a group and hopefully be able to park next to one another at the show. We should be arriving at Knoebels around 9:30am. 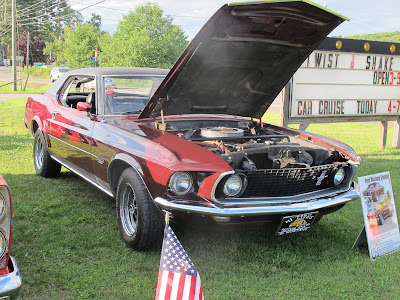 Some may want to stay for the entire Car Show and some just want to get a bite to eat look around for a little while and head back. We will leave it up to you to decide how long to stay. There will be an official ride back to Lehman, but the time of which will be arranged as the day goes along. Some of us will be traveling back together so if you want to head home with a group just ask around before we leave Lehman and we will let you know which cars are heading home together. We would ask a few things if you plan on traveling with us. Keep a safe distance between your car and the one in front of you ( 1 car length for every 10 mph) but not too far so that someone might pull out and separate us. Do not pass, arrive in the same order you left in. If the car in front of you pulls off the road quickly, please pull off with them so they have someone to help them if they are having trouble. Do not run red lights or stop signs to stay with the group. We don't want anyone or anything hurt.